Here are some of the more noteworthy things available in the Oxygen milestone build M7 which is now available for download. 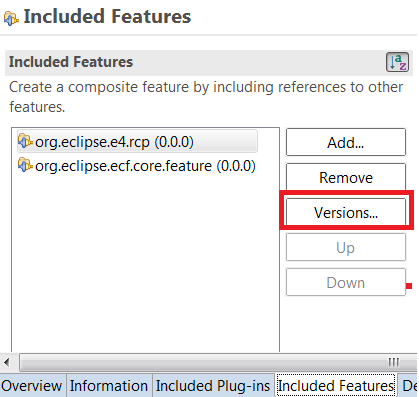 No Linux PPC 32-bit builds The Eclipse project has dropped support for Linux PPC 32-bit. 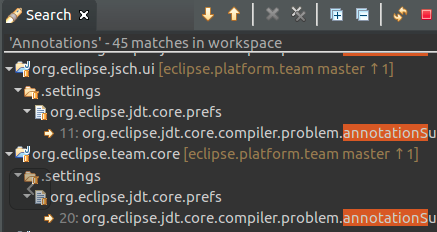 For this platform, no builds are available any more. For the Photon (4.8) release, we plan to drop support for the ppc64 builds as well, but keep ppc64le. 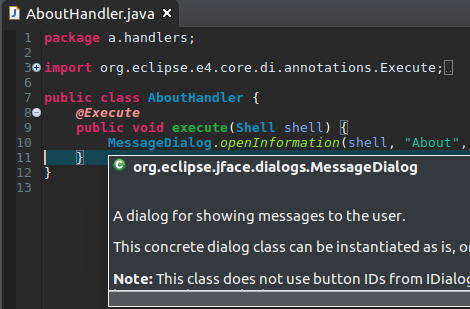 Eclipse as Apple disk image Eclipse SDK and Eclipse Platform products are delivered as signed Apple disk images on Mac OS X. For this platform, builds are available in signed dmg (Apple Disk Image) format on the download page. 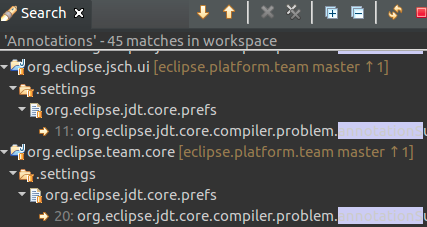 Default styling for table and tree headers The Eclipse default dark theme includes styling for the table and tree headers (which is now also supported on the Mac platform). 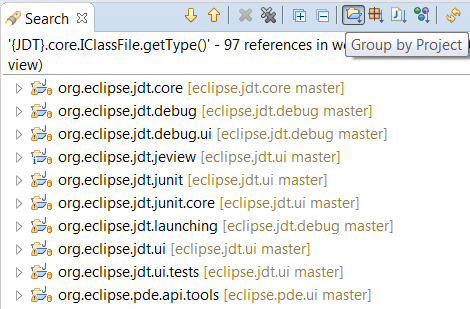 Group by Project in Search view The default grouping of Java search results in the Search view has been changed to Group by Project. Earlier the results were grouped by package. You can use the buttons in the view tool bar to Group by Project, Package, File, or Type. 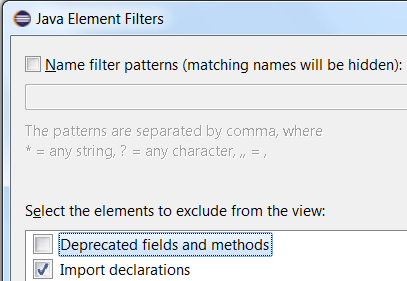 Defaults for annotation type elements in Javadoc The default value of an annotation type element is now shown in the Javadoc view and hover. 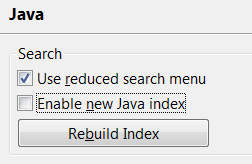 The new Rebuild Index button can be used to delete all information cached in the Java index. 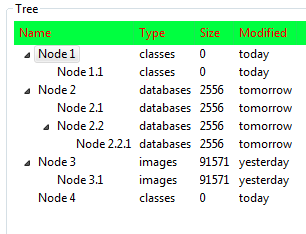 This can be used to save disk space after the new index got disabled, and to fix index corruption. 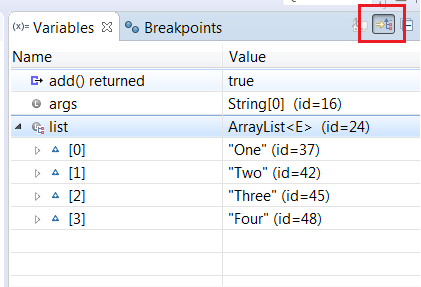 Show Logical Structure enabled by default In the Variables view, Show Logical Structure is now enabled by default. E.g. collection objects now directly show their contained elements instead of their internal structure. 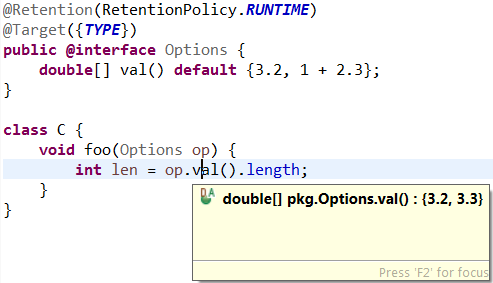 Pass compiler options to annotation processors You can now pass compiler options to annotation processors using %variable% syntax in Project > Properties > Java Compiler > Annotation Processing. 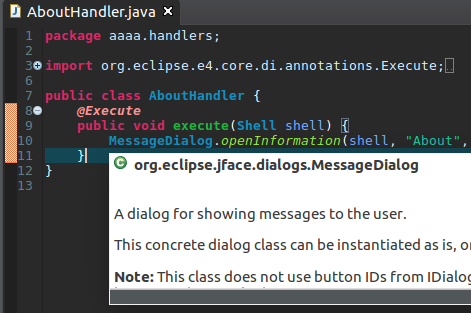 This allows processors to compile Java sources using the Java project's settings without manually maintaining this information in the processor options. Reload Target Editor When a target platform is already active, the Target Editor now shows a Reload Target Platform link instead of Set Active Platform. 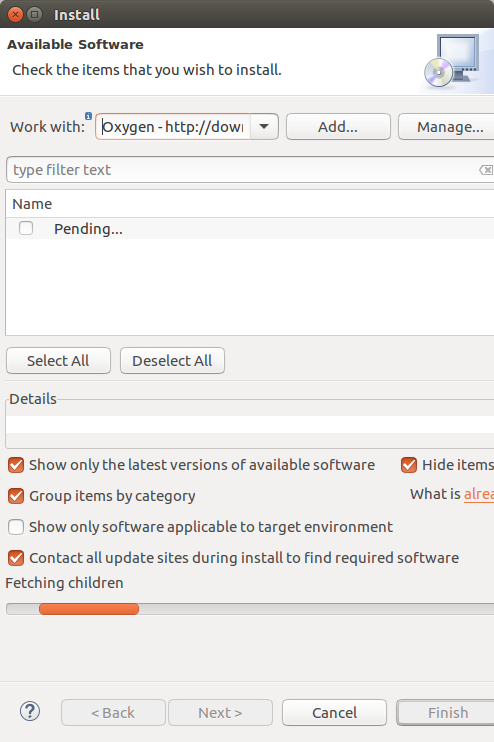 The reload link has the same effect as pressing the Reload button in the Plug-in Development > Target Platform preference page. 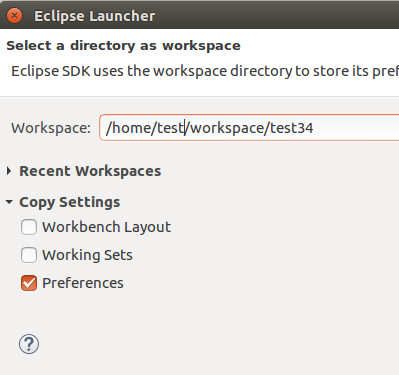 Tracing tab in launch configuration dialog has restore to defaults options In the launch configuration dialog, on the Tracing tab, there are new options to Restore Selected to Defaults and Restore All to Defaults. Quick Fix to configure problem severity You can now configure the severity of an API tools problem or PDE compiler problem by invoking the new Quick Fix (Ctrl+1). SWT table and tree header styling via CSS You can now style the SWT table and tree headers via the CSS engine. SWT Tree header colors Support for custom tree header foreground and background colors has been added on Mac, Windows and Linux (GTK3) platforms. SWT Table header colors supported on Mac as well The custom table header foreground and background colors APIs initially supported for Windows and Linux (GTK3) platforms now works on the Mac as well.